and Maps Imagery team recently published another batch of aerial and satellite imagery. In this post, we’ll focus on U.S. cities and locales, as the largest amount of new high resolution aerial imagery covers regions in the United States. High on the list of things associated with the United States are over-sized automobile tail fins. 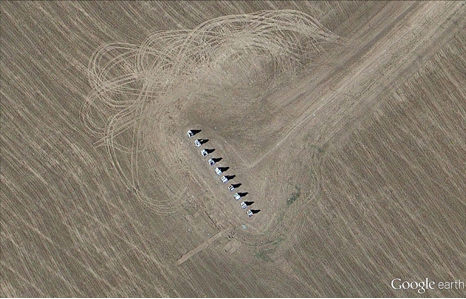 Our first aerial image shown below is of Cadillac Ranch, located near Amarillo, Texas. The series of partly buried and tilted Cadillacs is a public art homage to the iconic American auto. Our next example is of Downtown New Haven, Connecticut. 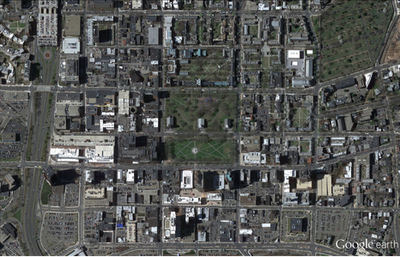 The image shows the center park square of New Haven Green, which is surrounded by eight squares of the same size that comprise a nine-square downtown area that was first drawn out in 1638, and represents the first planned city in the United States. Few U.S. rivers are more well-known than the mighty Mississippi. 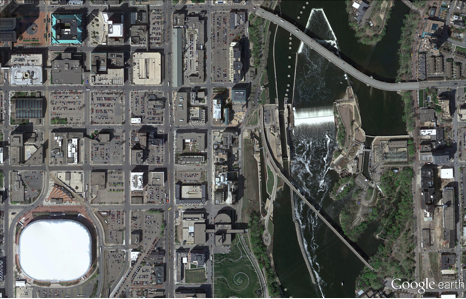 The aerial image below, snapped last month, shows a portion of the river’s northern extent where it forms Saint Anthony Falls in Minneapolis, Minnesota. The Metrodome Stadium, home of the NFL franchise Minnesota Vikings, can be seen in the lower left corner. The team has played its last game there and is about to sign a 30-year deal to build a new downtown stadium. The final example shown below is a section of the “Magic Dragon,” more commonly known as the Lake of the Ozarks. 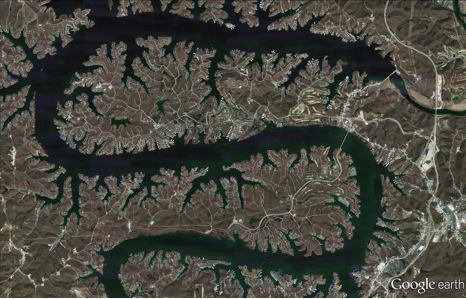 This sinuous man-made reservoir was formed by the damming of the Osage River in South-Central Missouri. More than 70,000 residences line the shoreline and the Bagnell Dam can be seen in the upper-right corner of the image. The Google Earth and Maps Imagery team recently published another batch of aerial and satellite imagery. In this post, we’ll focus on U.S. cities and locales, as the largest amount of new high resolution aerial imagery covers regions in the United States.